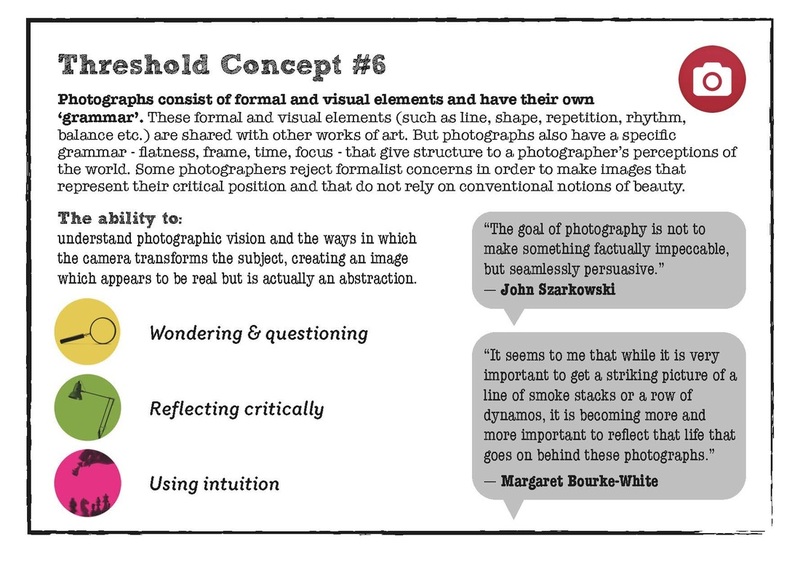 What is a Threshold Concept? 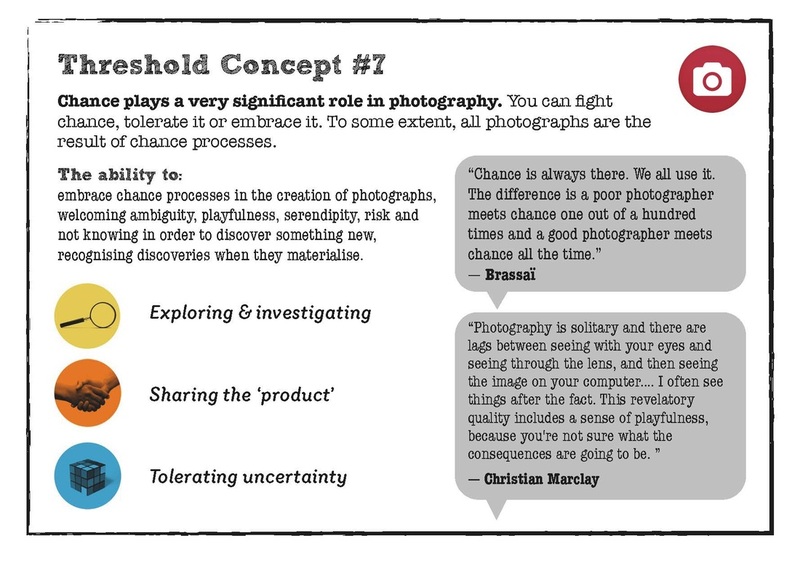 What are the threshold concepts that help to define the discipline of photography? 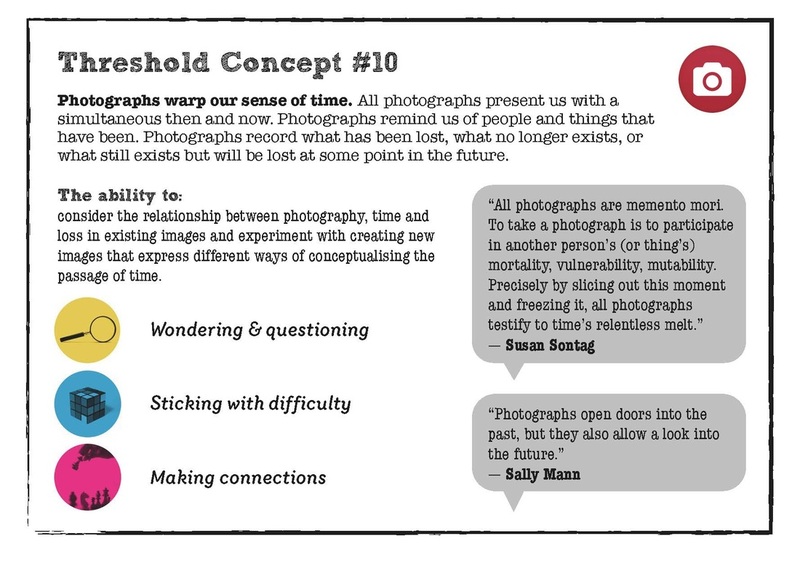 Over a period of weeks I worked with colleagues in and outside my school to develop a set of ten concepts. I felt that these would help us build a more coherent curriculum for our students from Years 9 through to 13. If we had a clear idea ourselves about what we wanted students to be able to understand about our discipline, perhaps we might be better placed to design sequences of lessons, beginning with the GCSE course, that would enable them to begin to tackle this "troublesome knowledge" and perhaps develop a degree of mastery over the course of their studies. 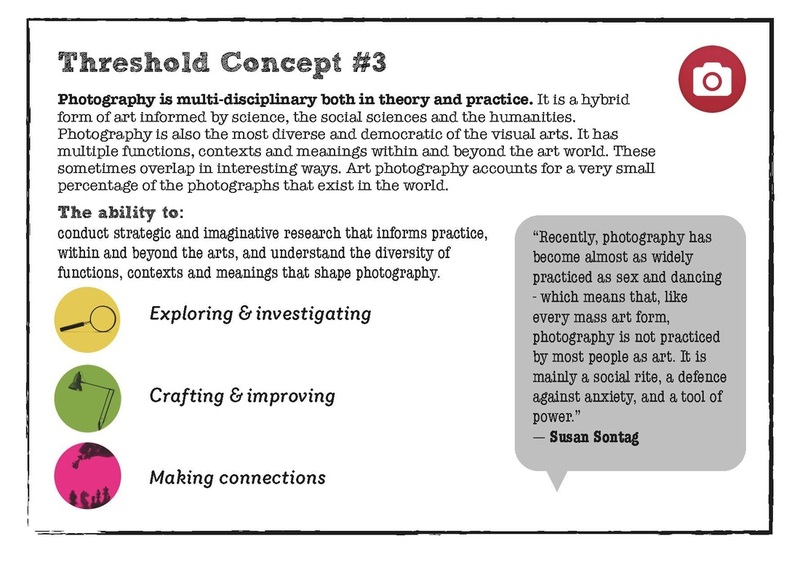 I also felt that it was important for colleagues, who may not necessarily feel particularly expert in the field of photography, to develop a shared understanding of these concepts so that we could together as a department build a more effective critical engagement with the discipline. Thanks to colleagues Chris Francis, Sarah Phillips, Anna Lucas and Dianne Minnicucci who collaborated on the creation of this resource. 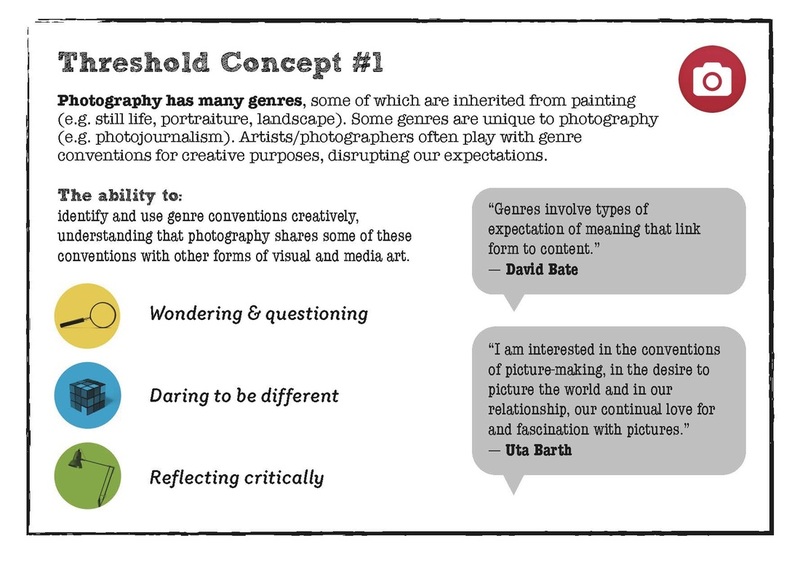 Photography has many genres, some of which are inherited from painting (e.g. still life, portraiture, landscape). Some genres are unique to photography (e.g. photojournalism). 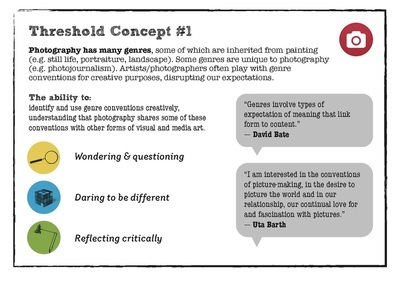 Artists/photographers often play with genre conventions for creative purposes, disrupting our expectations. All photography is the capturing of light (radiant energy) and includes images that are made without a camera or film. 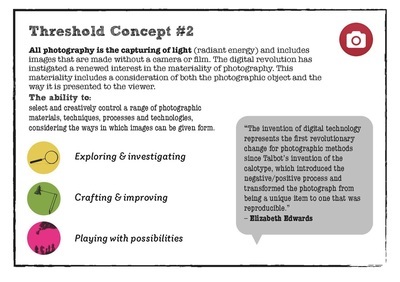 The digital revolution has instigated a renewed interest in the materiality of photography. 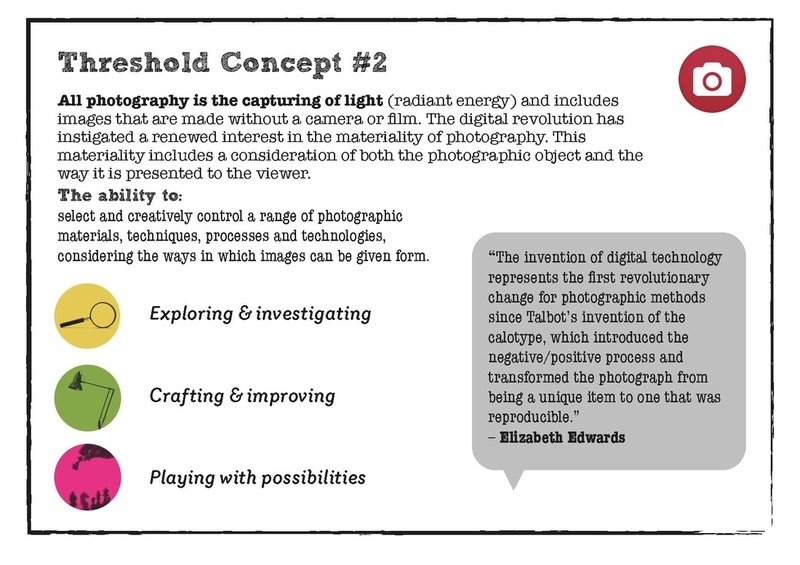 This materiality includes a consideration of both the photographic object and the way it is presented to the viewer. Photography is multi-disciplinary both in theory and practice. It is a hybrid form of art informed by science, social science and the humanities. Photography is also the most diverse and democratic of the visual arts. It has multiple functions, contexts and meanings within and beyond the art world. These sometimes overlap in interesting ways. Art photography accounts for a very small percentage of the photographs that exist in the world. Photography is unlike other visual arts in that it begins with a world full of things rather than with a blank slate. Photography is more an art of selection and translation rather than of invention. However, photography is also an art of production, not just reflection. It does things to the subjects it represents. Cameras ‘see’ the world differently to the way we see the world with our eyes. The physical object (whether this is a printed image or pixels on a screen) can sometimes ‘disappear’ because photography is able to generate an almost perfect illusion of reality. We tend to see only the subject depicted rather than the photograph itself. However, all photographs are, to some extent, abstractions. Most photographs are monocular. The flatness of photographs creates relationships between objects that may not have existed in reality. All photographic images have been shaped by the technology the photographer chooses and by a process of selection, editing and manipulation. Each and every photographic image is therefore made or constructed, rather than being a window onto the world. 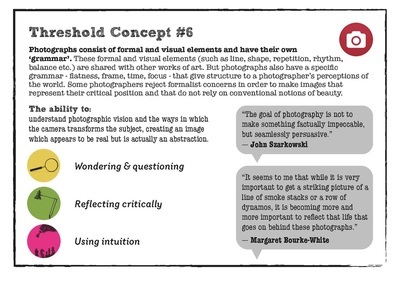 Photographs consist of formal and visual elements and have their own ‘grammar’. These formal and visual elements (such as line, shape, repetition, rhythm, balance etc.) are shared with other works of art. But photographs also have a specific grammar - flatness, frame, time, focus - that give structure to a photographer’s perceptions of the world. 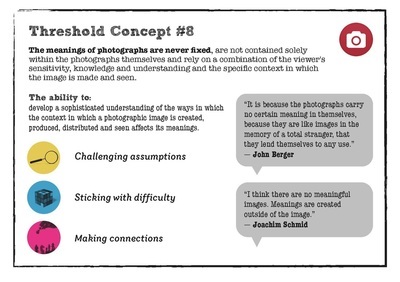 ‘Mistakes’ in photography are often associated with (breaking) the ‘rules’ and expectations of this grammar e.g. out of focus, subject cropped, blur etc. Some photographers reject formalist concerns in order to establish an aesthetic that represents their critical position and does not rely on conventional notions of beauty. Chance plays a very significant role in photography. You can fight chance, tolerate it or embrace it. 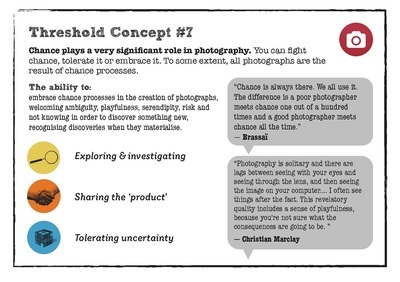 To some extent, all photographs are the result of chance processes. The meanings of photographs are never fixed, are not contained solely within the photographs themselves and rely on a combination of the viewer's sensitivity, knowledge and understanding and the specific context in which the image is seen. 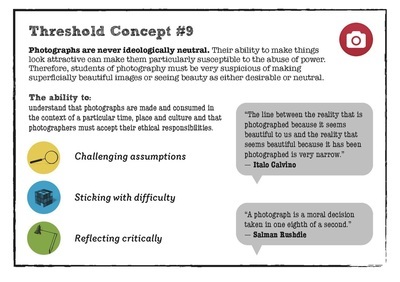 Photographs are never ideologically neutral. Their ability to make things look attractive can make them particularly susceptible to the abuse of power. Therefore, students of photography must be very suspicious of making superficially beautiful images or seeing beauty as either desirable or neutral. Photographs warp our sense of time. All photographs present us with a simultaneous then and now. Photographs remind us of people and things that have been. Photographs record what has been lost, what no longer exists, or what still exists but will be lost at some point in the future. 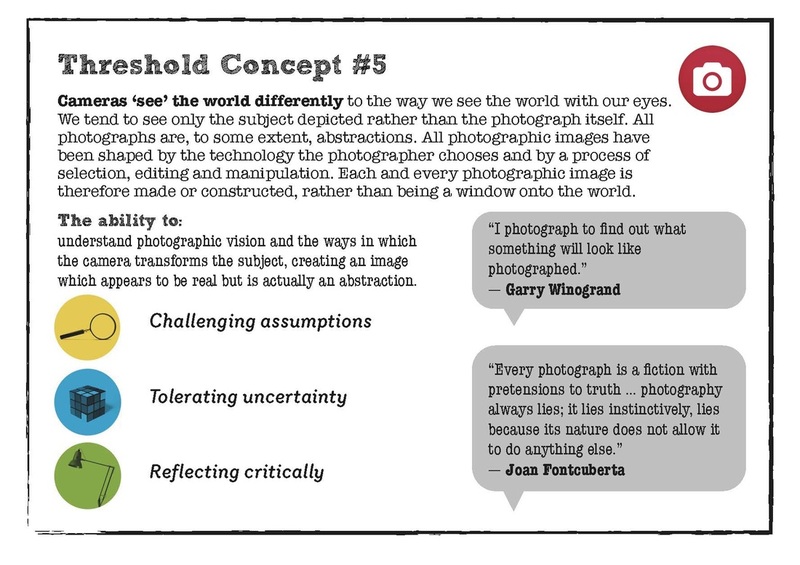 I decided to create a set of cards to help disseminate the concepts. These cards can be printed out and used individually or collectively to stimulate debate and reflection in a photography class. Click o the images below to expand. The complete set of cards can be downloaded below as a zip file. 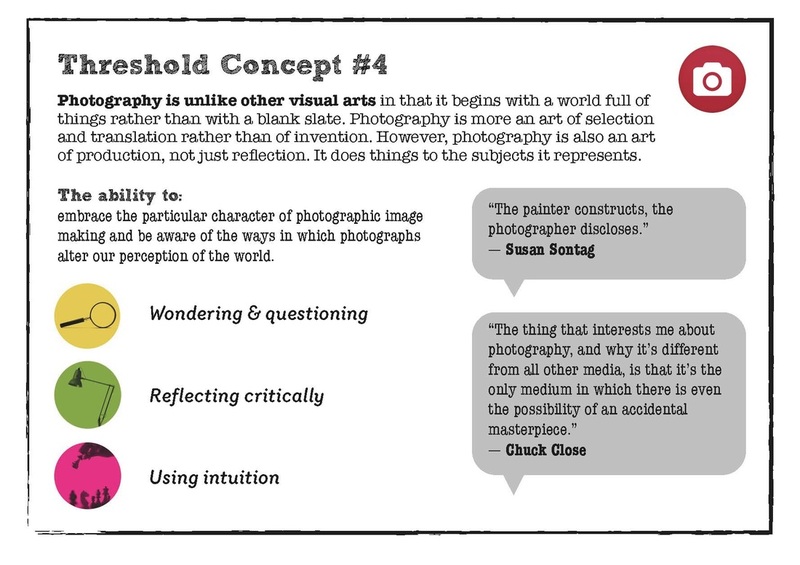 This activity is designed to encourage students to debate some of the big ideas about photography by taking on the mantle of the expert and engaging in meta-cognition. 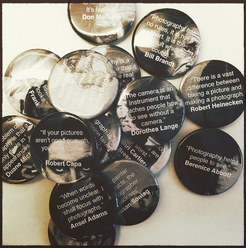 Each student is given a badge featuring the portrait of a famous photographer or writer about photography and a quotation that represents his/her views about the medium. Students are given some time to research their artist/writer (this could be part of a lesson or an extended period of study). There is then an opportunity for students to question each other about the quotation they are displaying on their badges. The interviewee should attempt to respond as the author of the quotation, explaining and expanding on the ideas associated with it. A deliberate effort should be made by the student to connect the views and ideas of their badge subject with their own practice. A set of badges is provided below as a template. Students could, of course, find their own quotations and design their own badges.